There are a handful of books that I purposely tuck away from the eyes of my children when I am done reading, for fear that the allure of a comic book will expose them to some unsettling things. 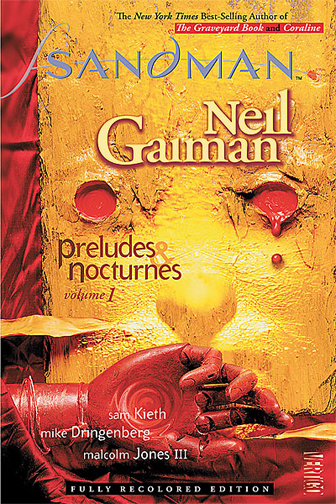 THE SANDMAN: PRELUDES & NOCTURNES is one of those books. Which is not to say this comic collection is not a terrific series worth all of the hoopla it has been given over the years. THE SANDMAN is an example of how comics can rise above the funny pages, as novelist Neil Gaiman shows with his astute writing in this series about Dream, the God of the night, who gets captured and imprisoned by humans (who really wanted his sister, Death) and must now embark on a quest for revenge and recovery of three magical items that have been stolen from him. Dream, also known as Morpheus and a slew of other monikers taken from various world cultures (including an amusing Mars reference), is not what you expect. This god is ruthless, yet compassionate. When asked, he helps humans in the night by relieving their suffering of nightmares. The stories in this collection of THE SANDMAN comics begin with his imprisonment and end with his sister, a beautiful and powerful goth-like Death, reminding him of his role in the world, even as she gently snuffs out the lives of those around her. What makes the stories so unsettling is the violence and chaos that erupts all around the world as Dream is no longer in charge of the night, and the nightmares take over. In one story, in particular, a madman in possession of one of Dream’s magical items unleashes the goriest, scariest and strangest scenes I have come across in comics. Even I was unsettled. It is not for children. And yet, Gaiman’s writing takes THE SANDMAN to such interesting places (including the depths of Hell), and you can see that his vision for Dreams is deep and rich. 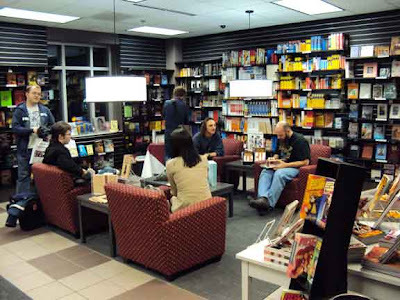 So, keep it away from the kids, but savor the storytelling here yourself. This series does not belong in any K-12 classroom. Period. I hate to say that because the writing is so rich and the characters are so well-defined. But the violence, profanity and sexuality are too much. It’s possible that a college-level course might find a home for THE SANDMAN, but even then, the professor would have to make sure students were aware upfront of the content they were being exposed to. Of course, this raises an interesting topic of violence in storytelling, and what role does uncomfortable content have in the books we read. Sad to say, I cannot recommend this book for the K-12 classroom. The violence, profanity and unsettling content make it inappropriate for those students. It might have a home in some college courses, but even then, I would have reservations. Still, if you like graphic novels and comics, THE SANDMAN is a modern classic that is worth your time, even if you never share it with anyone else. I’m a big fan of the anti-hero archetype because it seems more practical for someone to struggle between personal and societal morals, and these are sometimes overlooked in the superhero genre. 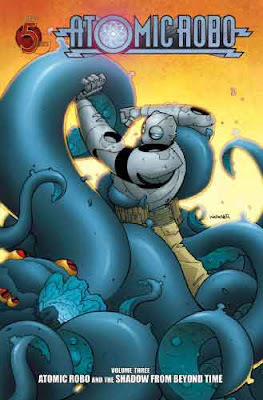 I also feel much more connected to the anti-hero since any signs of weakness means the character is imperfect and I can empathize or at least try to deconstruct the character having realistic actions and thought. 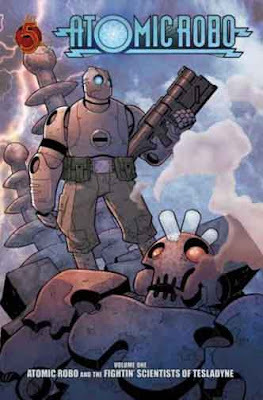 To put it simply, Warren Ellis doesn’t tip-toe around anything in NO HERO and really brings the anti-hero into a practical spotlight. NO HERO takes place in the real world and superhumans have been around since the 1960s, fighting against increasing violence and street crimes. Our protagonist, Josh Carver, has been patrolling the streets on his own to be noticed by the superhuman recruiter, Carrick Masterson. Carver explains he’s no hero (he accidentally killed a mugger by landing on him from a two story building) and wants to make the country a safer place and would do absolutely anything to become a superhero. Masterson is pleased with Carver’s determination and recruits him. 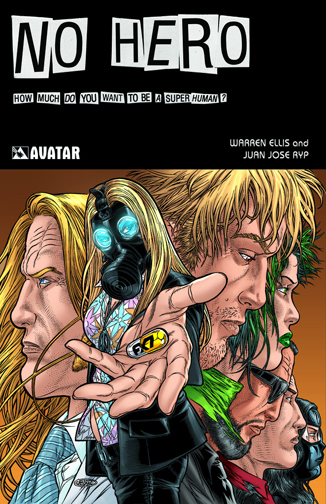 However, Masterson reveals his true intentions of running a superhuman agency and in the end, Carver, as well, reveals his true intentions, and explains why he continuously says he’s no hero. The colored illustrations are beautiful but also very violently graphic. I find this art style very appropriate and complimentary to Ellis’ writing, especially on a subject that is talking about violence. Seeing something visually graphic really brings in the realistic and practical aspect of the story which I feel is something that Ellis meant to intend. Carver rips out a superhero’s spine and attaches it to his hip to resemble a phallus. This may be an extreme shock to some readers but I found this to be the climax of the graphic novel. This came to reveal who Josh Carver really is as well as his psychological damage before he became a superhuman, and how this damage could have been transferred once he became a superhuman. Just this image itself explains a lot because I could hardly believe Carver was so accepting of his transformation into a mummified corpse (which also left him castrated) and continued to think everything would be okay just because he had super powers. There’s definitely a certain reason why Carver remained as the “ticking time bomb”. Aside from the very graphic illustrations, curse words are frequently used. The main thing to keep in mind are the parallels Ellis is trying to reveal through this story in regards to what the reader knows or the reader has experienced. There are large themes like terrorism and politics but also smaller themes like man vs. himself, morality, and sacrifice. There is definitely a different approach or perspective Ellis gives through the use of the superhero genre to construct this story and I’ve found that Ellis’ anti-hero has a touch of sadness to the character that may have readers sympathizing. during a meet-greet-and-sign at MSU. A TGC operative sent me an email about a comic signing at my local university. With bow tie and Spider-Man belt buckle, I rushed after school to see what was going on. 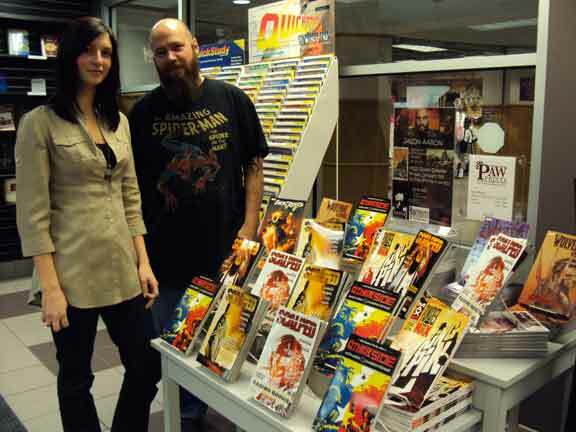 Jen Murvin-Edwards, creative writing instructor (Short Story Fiction and Intro to Graphic Narrative) at Missouri State University brought comic writer, Jason Aaron (SCALPED, THE OTHER SIDE) to MSU so her graphic narrative writing students could meet him. I told Aaron I was going to purchase a comic; however, I wanted him to tell me what graphic novel he thought I should purchase. For the purposes of the classroom, Aaron thought THE OTHER SIDE would be better than, say, SCALPED because of the length. THE OTHER SIDE it was and I asked him to sign it for TGC. Aaron signed comics and talked shop with the writers. The store front, which was a hair saloon just a few years ago, was now a quaint book store, with a significant portion of the shelves displaying comics. It was cool and a testament to how widely read comics are among youth. In 1995 I earned a bachelor's degree in English with an emphasis in creative writing. In high school I found I was good at writing but really discovered my passion for the art in college. For the life of me, however, I do not recall a single incident of enjoyable wordsmithing in elementary or junior high. So it is for scores of students and not just those in elementary or junior high. For many, the craft of writing is a tedious, purposeless and painful endeavor. I attribute a significant amount of students' rebellion to the fact that they have no real reason to write because their writing prompts are uninteresting. Rainbows and unicorns, beautiful flowers and honey-dewed meadows might be alright for 19th century poets, but they are not often inspiring to contemporary students. In one of my first creative writing classes, a lady 20 years my senior turned to me after the class critiqued my short story and commented: "Why don't you write a romance." She said she enjoyed my descriptions and slice-of-life approach, commenting she found much of it funny. Other things in my story were not appealing to her. She wanted something softer, with curved edges and delicate overtones. What I heard her say is that she wanted something other than ... me. I never forgot her request and eventually gave a stab at it, but I doubt the end product was what she was looking for. Sometimes, our school-based writing assignments can be similar to this lady's request. We ask students –– many of our boys and some girls –– to write about things that do not connect with them. Authentic and emotionally-connected writing for tweens and teens is already difficult enough. Giving them something they are not interested in or connected to is to remove the student from the power of words and rob them of the love of story. Writing, like reading, is about choice. Research clearly demonstrates that students who have choice in what they read are more interested in reading. Is writing really so different? Should we force upon student antiquated writing prompts that the students find uninteresting or bothersome? Give kids their fart jokes, their CAPTAIN UNDERPANTS, their swordplay and let them write about it. Bill Zimmerman's newest book, YOUR LIFE IN COMICS: 100 THINGS FOR GUYS TO WRITE AND DRAW is some strange hybrid journal-and-writing-prompt beast designed for tween and young teen boys (and some girls as well). When I cracked the spine and read the writing prompts and story ideas, I thought back to my approximately 200 third and fourth grade students. I envisioned certain students when I read some pages, and I thought of entire classes with others. Lesson plans ran through my head, writing ideas glowed, and authentic and real-world preparation for standardized tests pulsated in my mind. With this book, I concluded, we could teach students so many skills (prediction, inference, summary, sequence, narrative style, audience, persuasion, information, all those tested skills) while they simultaneously engage in the process of authentic writing. The prompts in this book are not artificial or school-based. They are real-world ideas that kids could write about successfully and would want to write about excitedly. YOUR LIFE IN COMICS could be utilized in the classroom in several ways. LEFT: Students can let their creative sides explore humor. RIGHT: Students who need an emotional connection or to see the positive things in their life might benefit from this "happiest memory" exercise. 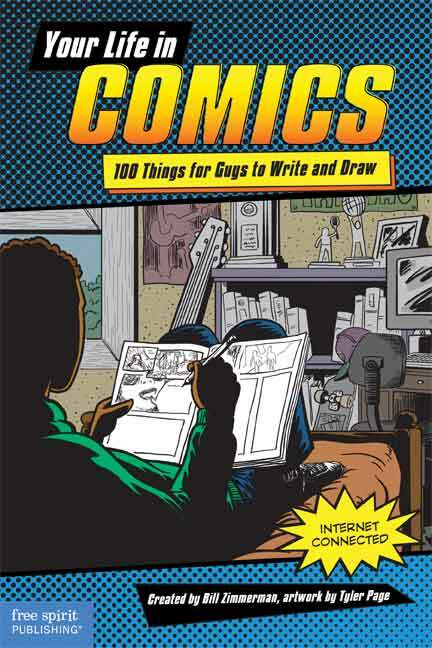 The pages are in comic format; however, that should not preclude a teacher from using the comic-based writing prompts as inspiration for paragraph writing. This is an important feature that should not go unnoticed by the teacher. Despite what you call it, YOUR LIFE IN COMICS could be a student's daily writing journal. A copy for each kid, students could use some communication arts time to write in their YOUR LIFE journal. Some of the comics may be completed and self-contained while others are simply a starting place for a much longer, traditional writing piece. Either way, the book gets kids interested in writing –– daily writing that is meaningful. I collect strange and unusual pictures from the Internet. Some are funny; others are odd. All of them are engaging images to kids. I will place an image on the interactive white board. As a technology instructor, I also simultaneously broadcast the image to all the student computers so kids are inundated with the image as they enter the room. They come in talking and laughing and sometimes shuddering. Engagement is high from the beginning. I tell the students to open Microsoft Word (but traditional classroom teachers could have them get out pencil and paper) and to write a story about the image. They are to type the story and print it off by the end of class. I allow students who need more time to come in before or after school or during recess to finish if necessary. I allow students a lot of personal freedom and creativity. If they want serious, humorous, science fiction, fantasy, realism … it matters not to me. I even allow CAPTAIN UNDERPANTS-style bathroom humor. I simply tell students to ask me if they are concerned with appropriateness. I see YOUR LIFE IN COMICS being used in the same way. 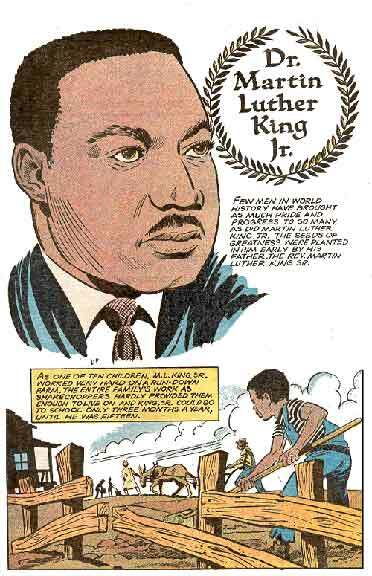 A teacher could project a particular page onto an interactive white board or projection screen and have students use the comic as a writing prompt. Kids could fill out the comic on paper as originally intended, or they could use the image on the screen to create a traditional paragraph-based story. The teacher could require students to write in first person or third person, persuade the audience, or demonstrate any other standard being covered. Another approach would be to give student writers 10 minutes to find a writing prompt from YOUR LIFE IN PICTURES. After choosing their own prompt, students are given a certain amount of time to write in their writing journals, based on their choice. This could be an on-going story that might take minutes, hours, days or weeks to complete. At the end, students could then practice editing skills by reading and editing each other's stories. Then the stories could be shared with other classrooms. The stories could also be copied and bound so they could be checked out from the school library. Let's not forget the power of online publishing where the stories could be shared with the global community using a classroom blog or website. Technology classrooms could go a step further by having the students create ebooks using Power Point. Zimmerman knows kids and teachers. Not only did he provide us with awesome comic-based –– but not comics-exclusive –– writing prompts, but he took the time to connect many of the prompts with outside websites giving the teacher a way to push the exercise further into the real world. I am reminded of the writing prompte that gets kids to learn about child-soldiers in South Africa. By going to the UN website for students, kids can then complete the child-soldier Web Quest and learn about current human rights. Now a writing prompt has turned into a global investigation about human rights, war and ethics, coinciding with social studies and technology standards. With a communication arts and social studies mash-up, there is no need to carve out separate time for each. LEFT: Students must use inferencing skills to determine what the characters are discussing. By evaluating facial features and body language, the students can create accurate dialogue. 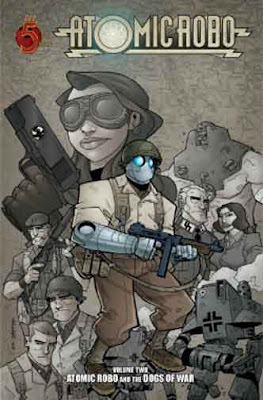 RIGHT: A sci-fi story that requires story sequencing. Notice the web connection at the bottom, encouraging further exploration. Zimmerman's book is an inspiration to the tween-teen and school communities. The power of his prompts, the depth of the ideas, and the inspiration YOUR LIFE IN COMICS brings is a alcohol-fueled drag racer of a writing engine. It is as Highly Recommended as a writing prompt book I've ever seen. I would not be without it. Download 16 pages for free (pdf). "As an author of interactive books to help young people find their writers' voices, I often am asked by educators and parents for help in reaching reluctant writers," said Bill Zimmerman creator of Make Beliefs Comix and YOUR LIFE IN COMICS. In addition to his book recently reviewed at TGC, Zimmerman also runs 4-year-old Make Beliefs Comics, a create-your-own-comic website to help students find their writer's voice. 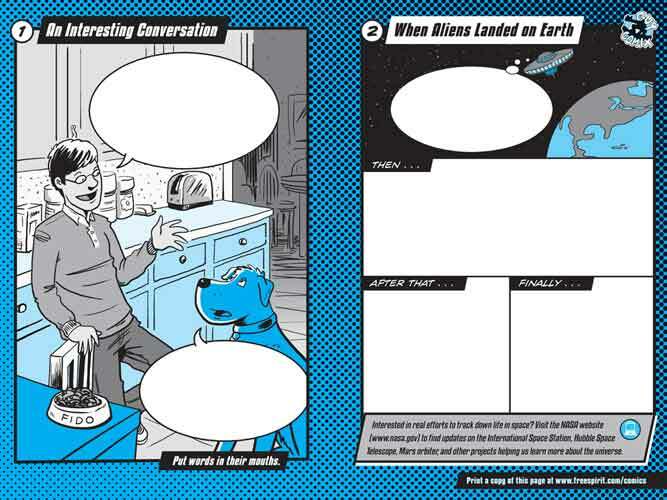 Zimmerman offers blank comic panels for students to interactively create their own comics. Dialogue bubbles, narration bubbles, 20 different characters, multiple character expressions, and settings, everything is there for students to create and explore. Students can also write in seven languages. In addition to his online comic creator, Zimmerman just released over 100 free printables for teachers to use with students. These include pages from his recent book YOUR LIFE IN COMICS and other books he's published. The prompts are good. The download process is easy. Kids will enjoy it. There are plenty of ideas to choose from. Zimmerman's site is outstanding and helps students cultivate their writer's voice and an overall interest in writing. 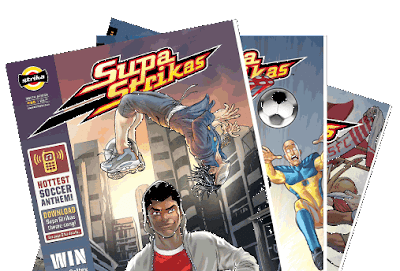 SUPA STRIKAS is a South African soccer comic and animated series that is gaining popularity, so much so that CNN covered the comic. Now it's time for me to try to get my hands on it. I know some kids that would come unglued at the opportunity to read an ongoing soccer comic. Several issues are available free online. Thanks to TGC operative, Evan, for the link.